Whether it is an extremely hot day and you want to keep your drink cold during a day at the beach, or if it is an extremely cold day and you want to keep your hot chocolate nice and hot while you are traveling during a winter storm, having a multifaceted tumbler comes in handy in both cases. There are plenty of outdoor oriented companies that sell tumblers that excel in both temperature extremities, but we have picked out some of our favorite outdoor companies and stacked their tumblers against each other to see what materials are used during manufacturing and how well they perform. We wanted to know what is the best tumbler. So, we compared Yeti tumbler vs RTIC tumbler vs Ozark Trail tumbler vs Orca tumbler and more. 18/8 Stainless Steel – All of the tumblers that we compared were made of the very same grade of 18/8 stainless steel. Sweatproof – All of the tumblers we looked at were sweatproof. Performance – All of the tumblers performed nearly identically. Price – Prices ranged from $39.99 (Yeti) to $9.74 (Ozark Trail). We found the cheapest model to perform equal to the highest price model. We recommend the Ozark Trail as the best tumbler for the money. The first brand that we tested was the Yeti tumbler. The Yeti name is synonymous with quality and luxury in the world of outdoor activities, so I was really excited to try out the Yeti tumbler. Featuring a tried and true double wall vacuum insulation, the Yeti Rambler tumbler can keep cold drinks the coldest and hot drinks the hottest. Created from high quality 18/8 stainless steel, you won’t have to worry about your Yeti Rambler sweating, due to its no-sweat technology. Available in a wide variety of different sizes and the ability to be customized, the Yeti Rambler is a good choice, but probably gains the most attention because of the Yeti name. Like all things Yeti, this tumbler is a bit higher in the price range, with the standard 30 ounce Rambler coming in at an MSRP of $39.99. The next tumbler that we decided to try was the 30 oz. RTIC tumbler. This tumbler also has the double wall vacuum insulation that keeps your drink at the optimal temperatures, and no sweat technology. 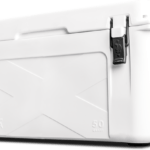 The RTIC tumbler had all of the features of the Yeti, including the coveted 18/8 stainless steel. The only real difference was that it was half the price with an MSRP of $14.99. Next, we tried the Ozark Trail tumbler, which performed just as well as all of the other tumblers, but was definitely the most affordable. Ozark Trail’s 30 oz. tumblers can be found at Walmart or other department stores for under $10, and there is word going around (unconfirmed, mind you) that both Yeti and Ozark Trail are manufactured in the same factory. This was our favorite choice of the bunch. We found that the only reason someone would ever go for the Yeti Rambler is for the name alone since it had virtually no difference in the manufacturing and performance of the other choices as far as we could tell. We also tried the Titan 30 Oz. tumbler which had all the same qualities as the Yeti, RTIC, and Ozark Trail tumblers, except its pricing comes at around $12.99. The 30 Oz. Geyser tumbler also comes in at $12.99. After having compared all of these different tumbler brands and models, we soon began to realize that none of them have much of a difference between the construction and their performance. They all shared the same basic design, construction materials, performance, and sizes. The only difference that we could find was their price. While most of the tumblers that we looked at were 99% the same, the only exception was the Orca Tumbler. Orca’s Chaser Tumbler functions and performs essentially the same as the rest, and it too is made from 18/8 stainless steel. However, what makes the Orca Tumbler unique is it’s size and color choices. The Orca Chaser Tumbler is comes in many powder-coated color options, such as red, salmon, green apple, purple, blue, gray, yellow, and several more colors. Also, while most of the other tumblers were either 20 oz. or 30 oz., the Orca Tumbler is 27 oz. While the color options make them unique, at almost $25, only you can decide if the Orca Tumbler is worth the extra money. In conclusion, we feel that all of these tumblers look, feel, and perform the same. We suggest opting for the Ozark Trail tumbler if you are looking for practicality, affordability, and peak performance in the temperature retention of your beverages. We feel this is the best tumbler for the money because it has all of the same qualities and features as even it’s most expensive competitor, they have excellent reviews on both Walmart’s site and Amazon, and they can be found in most Walmarts, or on Walmart’s website for under $10. Need more proof that the Ozark Trail Tumbler is the best tumbler for the money? Watch this quick video comparing it vs two other top brands.